All you’re missing is a margarita! 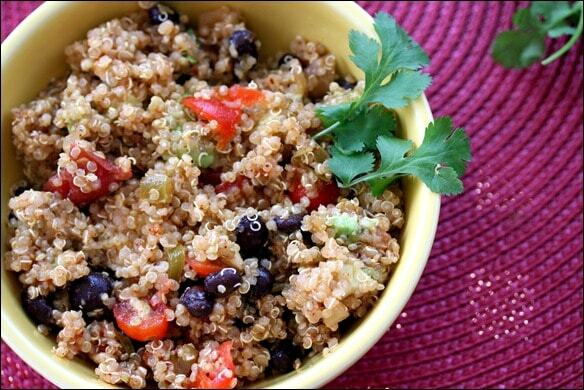 This quick and easy vegan quinoa salad is perfect to make early and enjoy throughout the week. Packed with flavor, color, and texture, you’ll get your Mexican fix without all the cheese or calories. 1) Combine quinoa, water, and vegetable broth in a pot. Bring to a boil, then cover, reduce to a simmer, and cook 10 to 12 minutes (until all liquid is absorbed). 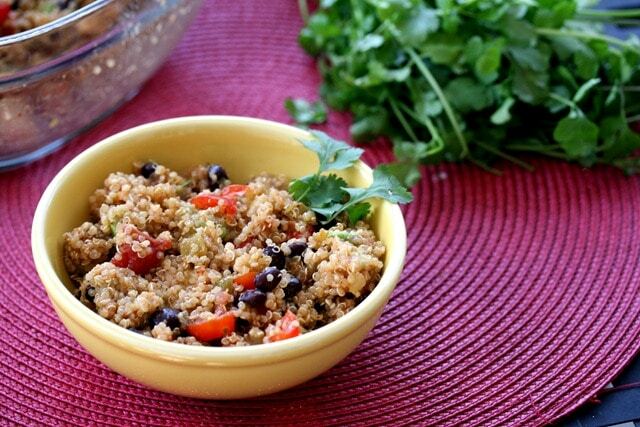 2) Let quinoa cool, then combine in a large bowl with all other ingredients. I had a bowl of it yesterday for lunch. Delicious! Previous article: Exercise Game Plan for Pre-Half Marathon Week! Hey Anne! I love your blog, but I think this is my first time commenting! Anyway, this recipe looks awesome and I think it will be perfect to bring to my friend’s upcoming bridal shower. One of the other bridesmaids is a vegan and I’ve been trying to figure out what to bring – looks like I’ve found my dish! Have a great day and good luck in your race this weekend! Mexican food has been everywhere lately – and I’m totally loving it! 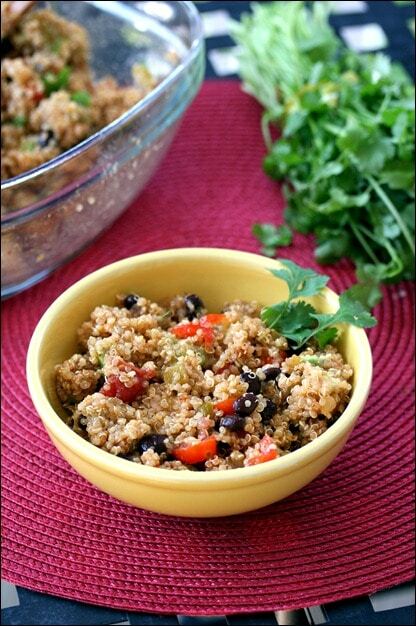 I need to restock my quinoa stash – this looks nice and filling! I love anything that I can add quinoa to. :) Great recipe! This looks delicious – love finding new ways to use quinoa, it’s such a delicious grain! I love Mexican inspired foods! Good idea doing it with quinoa instead of rice! Hmm…problem is, this would require us actually having leftover quinoa!! I think you misread the recipe – it calls for raw quinoa! I didn’t have any on hand… the recipe instructions include cooking the quinoa. Oh goodness, this looks awesome!!! I just made a mexican inspired quinoa salad a few nights ago with black beans and mango but now I may be making this one too. I have quinoa for the first time last Thanksgiving, as I was looking for vegetarian recipes for many of my guests, and made stuffed tomatoes. 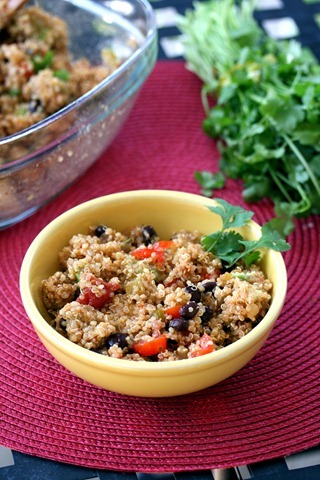 I loved the quinoa and have been looking for other quinoa ideas, and this one sound delicious! My kids love Mexican too, so I’ll have to give this one a try this weekend. Thanks for sharing! This sounds like a great recipe. I just “pinned” it for future reference. I actually made a spanish quinoa the other day in place of spanish rice and it was amazing. But I love your idea of adding black beans and avocado — my favs!! Thanks for sharing. Just made this, and it is quite delectable. Perfect combination of flavor and nutrition, with simplicity to boot. Thanks for sharing. I made this today, and its so amazing. Thanks for the recipe :) now i can have mexican without feeling bad. i think i could eat the whole bowl myself lol. Just pinned it. Will make it soon. Thanks for the recipe! Sounds delicious. I’m always look for more vegan recipes to add to my weekly meal planning! 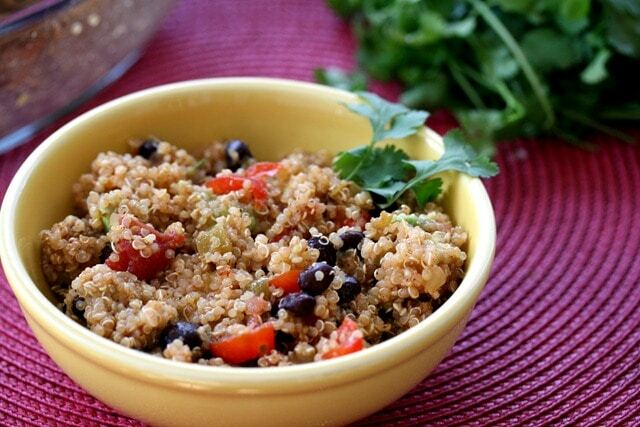 This sounds like the perfect trick for my latest quinoa obsession! Thx for this simple & tasty recipe! I just made this for lunch & it was delicious & filling. I also added some green onion & a little squeeze of fresh lemon. I’ve got plenty left over for later or tomorrow. This was my first experience with quinoa and I can’t even begin to tell you how delicious I found this dish. I mix up a batch of this and add fresh avocado when I feel like having some for lunch. Yum yum yum. This was so easy and amazing! I used red kidney beans because I was out of black and added some lime juice and nutritional yeast and wow! I couldn’t wait for the quinoa to cool so I am eating it warm! Awesome new staple! Thank you!!! My family loved this recipe. I added a chipotle pepper and used mango salsa. It was very flavorful! Thanks for sharing. Just made this recipe tonight for dinner. My meat-eating husband who was complaining about not eating a lot of meat lately said while eating, and I quote: “This tastes sorta like Chipotle, just without the yummy pork…. No, this tastes just like Chipotle!” I’m a vegetarian, so naturally I loved all the fresh vegetables. Another great recipe – thank you! I made this last night for a BBQ w/ friends and it turned out perfectly! The bowl was empty at the end of the night. I think everyone welcomed the healthy option :) ….And who can say no to Mexican flavors (not me)!